GENEVA, Feb. 26, 2019 /PRNewswire/ — The Kingdom of Saudi Arabia announced on Tuesday that it is contributing USD $500 million in new funding for the UN-approved Yemen Humanitarian Response Plan (YHRP) for 2019. This donation increases the support provided by the Kingdom to help the Yemeni people to more than USD $14 billion since the start of 2014. 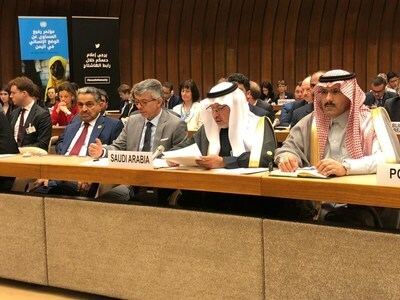 The announcement of the latest funding was made by His Excellency Dr.Abdullah Al Rabeeah, Advisor to the Royal Court and General Supervisor of the King Salman Humanitarian Aid and Relief Center (KSrelief), during the annual High-Level Pledging Event of the United Nations Office for the Coordination of Humanitarian Affairs (OCHA) held in Geneva. “I am pleased to announce that Saudi Arabia is donating USD $500 million to finance the Yemen Humanitarian Response Plan approved by the United Nations for 2019,” Dr Al Rabeeah said in his speech. He said Saudi Arabia is pleased to announce its readiness to host the Yemen pledging conference in 2020 in the Saudi capital Riyadh. Dr Al Rabeeah said the new funding is in addition to recently announced aid such as “Imdaad” initiative to support food security and nutrition in Yemen, for the amount of USD $500 million split equally between Saudi Arabia and the United Arab Emirates, as well as a payment of USD $70 million split equally between Kingdom and the UAE to help pay teachers’ salaries in Yemen. He also cited the programs and initiatives by KSrelief, and the Saudi Development and Reconstruction Program for Yemen (SDRPY), which aims to implement development program to support the stability of Yemen. “We meet today as the Yemeni people look forward to the outcome of our meeting to overcome the humanitarian, security and economic challenges that they face because of the inhumane practices of the Houthi militias. Despite the great efforts of the United Nations and the international community, Yemen is still suffering a lot because of the intransigence of these militias and their failure to respond to the resolutions of the United Nations and the international community,” he said in his speech. “Humanitarian action in Yemen faces significant challenges as a result of the negative practices of these militias, which obstruct the access of humanitarian aid and seek to target and seize it,” Dr Al Rabeeah said, adding that 12 of these breaches have been monitored since the signing of Stockholm Agreement and up to now, including the laying of mines and the denial of access to the Red Sea Mills in Hodeidah. The ambassador of the Custodian of the Two Holy Mosques and the supervisor of the Saudi Development and Reconstruction Program for Yemen (SDRPY), Mohammed bin Saeed Al Jaber said that the Kingdom has always been keen to support the Yemeni economy and the Central Bank of Yemen, with USD $2.2 billion most recently in addition to the previous deposit of USD $1 billion. Al Jaber said the Kingdom has always been, and continues to be, the largest supporter of Yemen and the United Nations Humanitarian Response Plan announced in 2018. To help fund that plan, Saudi Arabia and the UAE have provided USD $1 billion, split equally, while Kuwait donated USD $250 million. USD $70 million of the total has been allocated for the rehabilitation of ports and roads, and providing cranes in the ports of Aden, Mukalla, Nishtun and Socotra. This initiative aimed to increase the capacity of these ports, and the volume of relief and trade imports, which reached 2.7 million metric tons of foodstuffs, fuel products, medical supplies, and other materials during the first half of 2018. In addition to this, he said there were various programs and initiatives being implemented by SDRPY in health, education, energy, transport, water, agriculture and fisheries to support the economy, maintain security and stability, and provide employment opportunities for the brotherly Yemeni people. The support provided by Saudi Arabia to the Yemeni people, in partnership with KSrelief as well as international and regional humanitarian organizations, was not limited to providing food and humanitarian assistance to millions of beneficiaries, but also includes supporting Yemen with oil derivatives, Al Jaber said. He stressed on the importance of this support of USD $60 million monthly to Yemen’s electricity stations, which contributed effectively to the continued delivery of electricity to many Yemeni governorates without interruption, benefiting 18 million people. He said that the support has also contributed to easing pressure on the Yemeni government budget, effectively contributing to the disbursement of salaries of state employees, especially health and education workers, and helped the Yemeni government to strengthen its capacity to implement service projects. Al Jaber said that the financial support provided by Saudi Arabia, UAE and Kuwait has been spent on the programs of 12 United Nations organizations operating in 11 sectors, including food security, health, water, and sewage, in addition to partnerships established with 86 United Nations and international organizations, which have had a significant impact on Yemeni society.